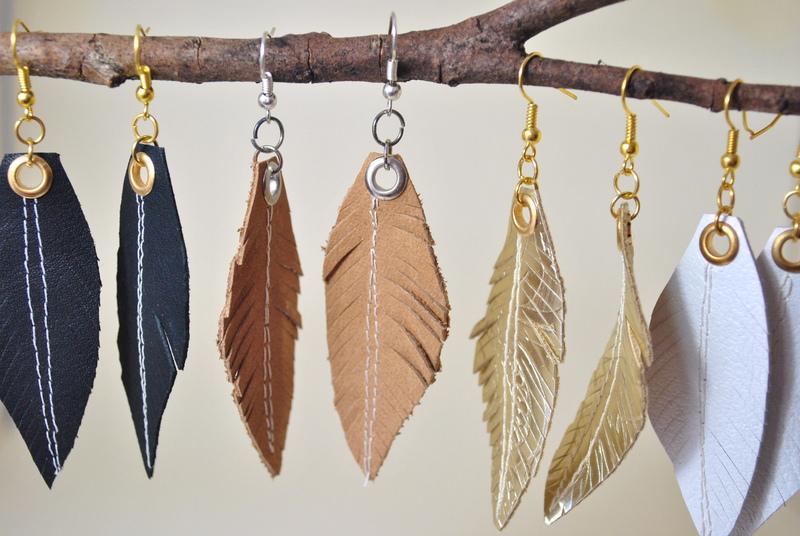 Up-cycled leather feather earrings by Nadine Schmoll of Spitfire Designs. If you haven’t heard of it, which I hadn’t until recently, Reverse Garbage is a wonderful non-profit initiative in Woolloongabba that collects industrial discards and sells them for cheap, saving both the environment and the customer. Items sold can be used for art, jewellery making, set designing and many other creative endeavours. This month Reverse Garage is holding a Valentines-themed exhibition in its warehouse – Love Up-cycled: Handmade objects from the heart. The exhibition will showcase 25 local Brisbane artists who up-cycle. Like recycle, but better. They’ll be presenting a range of love-themed gifts in preparation for Valentine’s Day. Or you could just treat yourself; you don’t need a relationship to buy jewellery, right? The exhibition runs for three weeks, but the free opening event is on Saturday the 8th of February, from 6:30-8pm. Brisbane duo The Phoncurves will be playing, there’ll be late-night shopping, free snacks (free snacks!) and a cash bar. Nadine Schmoll, the face behind Spiritfire Designs, is one of the artists exhibiting at Love Up-cycled, and she’s also Reverse Garbage’s Workshop Co-ordinator and Board Director. Nadine’s been a long-time customer at Reverse Garbage and she finds salvaged materials inspire the art she creates. “They set the framework for my art to occur. Using salvaged materials means I need to let the process be guided by what I have available to me at the time, as I try to use as many up-cycled elements as possible. The actual process of finding materials is also very inspiring – it may spark an idea, a colour theme or experimentation,” she said. At the exhibition Spiritfire Designs will be selling leather feather earrings, mini dream catchers, chandelier crystal & fabric flower hairpins and bow ties, all made from re-used materials. 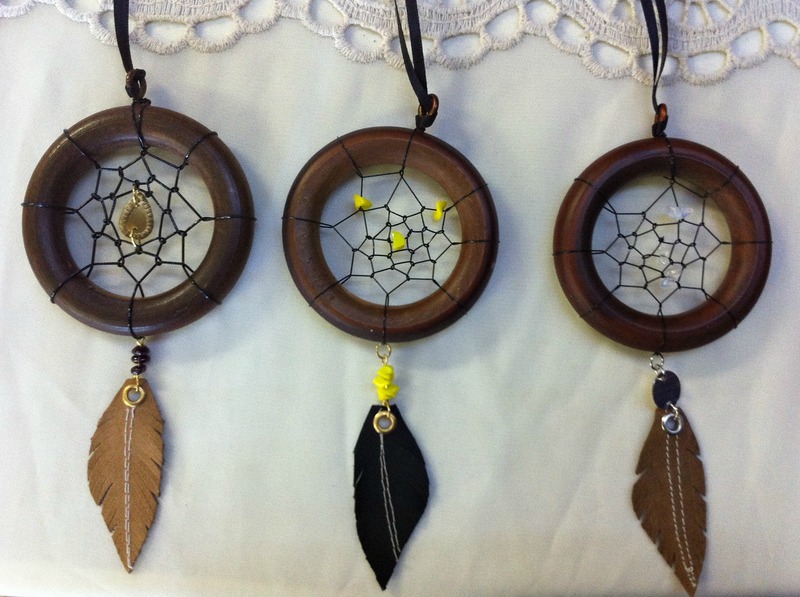 Up-cycled dreamcatchers by Nadine Schmoll of Spitfire Designs. Self-taught artist and veteran user of salvaged materials, Samantha Gilkes of Jetta’s Nest will be exhibiting at her fifth Reverse Garbage exhibition. Samantha’s been re-using materials for 15 years now, aided by her carpenter husband and a friend who owns a mobile saw-mill. “I first started using salvaged wood pieces to paint on after painting a mural on a wooden dining table for a friend. The wood I used was quite hard for me to source then but after meeting my husband it became something I had ready access to so I stuck with it,” she said. Jetta’s Nest will be selling a number of salvaged wood wearable art jewellery pieces, including brooches and necklaces as well as cards made from recycled card stock. If you miss the opening, the exhibition will run from February 8-28, Monday to Saturday from 9-5 at Reverse Emporium, Reverse Garbage, 20 Burke St, Woolloongabba.